These days Americans seem to be rethinking the “bigger is better” attitude, and embracing more petite surroundings. Smaller homes and even smaller micro-apartments are all the rage. There are lots of advantages to living in a smaller space, including saving money, saving time (less to clean! ), and reducing one’s carbon footprint. However, there are some obvious challenges, especially when it comes to storage. The solution to the storage problem is multi-layered. First comes reducing the amount of stuff in your life. Next comes lots of small tricks for making the most of the space you have, and here is where curtain tracks can help by replacing the closet door. Some constants in life include death, taxes, and overstuffed closets. The first step to an organized, efficient closet is to get rid of what is not absolutely necessary. Next, small things like adding hooks and shelves to make the most of the vertical space can be very effective. Storing out of season clothes in an under-the-bed bin is also very helpful. We can help you go even further. A curtain track installed on the wall or ceiling above the closet opening will allow you to replace the closet door with a curtain. Curtains can be pushed all the way to the side when not in use, allowing access to the whole closet at once, and making the wall and floor space typically needed for opening the door, usable. 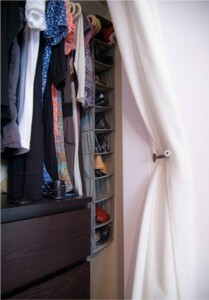 Every inch counts when in a small space, and curtains as a closet door will maximize every inch in and around the closet. Many of our curtain tracks can be used for this application. A popular choice is our custom-cut 6100 Flexible Curtain Track, which can be used in a straight configuration or bent by hand, without compromising strength, into curved or angled shapes. Another popular choice is our 84003 Ceiling Mount Curtain track kit, which comes with all the drapery hardware needed for installation, including ceiling clips and carriers. Our customer service reps can help you decide on the best curtain track for your closet door, given your space and needs. Give them a call at 888-434-7444 to discuss.